There’s that one Italian export that reigns undefeated above all others… that mouth-watering, arteries-clogging, highly addictive round disc of bread with things on top, someone at some point decided to call Pizza. That someone presumably lived in Naples, where the Pizza is said to be born (no liability assumed). And whilst still today you generally find the best Pizza in Naples, there are quite a few exceptions, and in my humble opinion”Dar Poeta” is one of them. Now, I gave this some serious thought before writing this article. But then I went back to this Pizzeria very recently and as soon as the first slice was on its way to my abdominal region every bit of a doubt vanished and the Spotter in me knew what he had to do. The name, “Dar Poeta” means “At the poet’s” and while the name actually refers to a famous Roman poet, I like to think of it as an allegory for how they make their Pizza taste like poetry (yes you may call me kitsch). 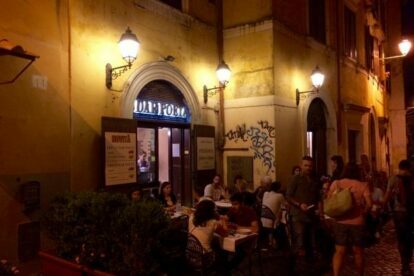 You’ll find Dar Poeta in the labyrinth of Trastevere’s alleys, which makes up as a very swell setting too, and if you’re lucky you may even get a table outside. Another aspect worth mentioning is their reasonable prices, that get even more reasonable once you consider the location and the quality. You’re gonna have a hard time spending more than €14, drinks included. If you must know, my personal favourite is the “Sarmonata” with salmon, Gorgonzola and rocket.